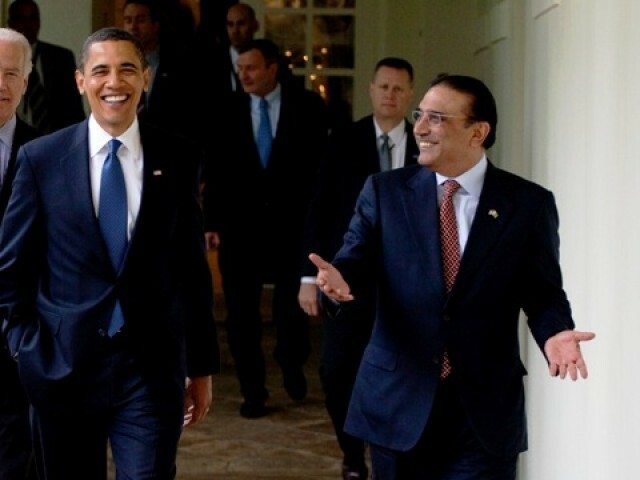 Zardari-Obama meeting: 30 minutes in vain? Why did Zardari go to Holbrooke's memorial service? US President Barack Obama spared only 30 minutes for a meeting with our president this Friday. And even after those 30 minutes, the same drone (no pun intended) of mutual cooperation and cordial relations was discussed. That is what our government seemed to be jubilant and honoured about, completely forgetting the cold shoulder we received in November when Obama visited India and China, while conveniently skipping Pakistan. The most pressing issue of drone attacks in the western half of the country was not discussed. Countermeasures to deal with terrorism, which was slow gnawing into our society at first and is now tearing major chunks of humanity out of us, also went untouched. It seems that the only issue on the table was that the president and the democracy – if you can call it that – stay in Pakistan. And these 30 minutes were just that: a reciprocal pat on the back to ‘hang in there’, as both presidents face the last two years of their tenures. After the ‘private’ meeting, President Zardari along with Obama attended the memorial of Richard Holbrooke, the late US Special Representative to Afghanistan and Pakistan – the main reason of his visit to the US. Holbrooke’s death is definitely a big loss to the diplomatic community and his memorial was a very diplomatic affair. Perhaps Ambassador Hussain Haqqani or someone belonging to the US-Pakistan diplomatic circle could have represented Pakistan instead of Zardari, who happened to be the only other president at the memorial apart from the president of Georgia. So why did our president go to the memorial? You do the math. I assure you, it will not take 30 minutes. I think Neha Ansari you missed the idea of the trip and then proceeded to bloat your assessment of the meeting of Zardari, with our President Obama. This was NOT a policy trip as you are trying to mislead your readers, this was Zardari’s attending the memorial of Richard Holbrooke, the late US Special Representative to Afghanistan and Pakistan and at such memorials policy meeting are not scheduled as this would be seen as a sign of disrespect. Maybe in Pakistan a funeral memorial service is also used as a venue for policy debate but herein America the memorial was a homage to a find person who worked till his death to bring a delicate balance to two troubled countries. I think it was better for President Obama to visit Pakistan separately than combine it with his November trip to India and China. This gives him more time in Pakistan than a hurried dash, but I see no matter what he does there would be some groaning. Also the security measures to protect him in a dangerous environment like Pakistan are probably a major concern of his security detail. Zeenab- Oh how conveniently you skipped over the last part of the blog which states what was the purpose of him even using taxpayer money to go to the funeral. Clearly only Presidents of elite & ultra-wealthy nations such as Pakistan & Georgia go to these funerals since everything is so peachy in their own countires. Some people have the habit of writing for the sake of writing, and author of the report falls in the same category. Is she upset on attending the funeral service, the meeting between two presidents or the visit itself? Its obvious that Zardari promarily was in Washington for Holbrook funeral, and it is unprecedented for US president to invite foreign dignitries on private visit to White House. It was more of a courtasy call than formal trip. Even though Hillary and National Security Advisors were in attendance, whreas Zardari was accompanied by Haqqani only. Why any one would pay attention to the worst Pakistani head of state!!! even his own countryman don’t!! except for grin or fake smile on his face,what else he can give…his visit was merely to make sure that he be allowed another two year extension from the Big boss…uncle sam!! Yes, Holbrooke was a great diplomat as some say. But if he was so important for the AfPak bloc, why didnt Karzai go? What’s the pupose of Obama coming to Pakistan? I don’t understand why people get hot under the collar about Obama visiting Pakistan. When he does come the meeting will go something along the lines of Pakistan has suffered due to terrorism.It must do more to clamp down on the Taliban yadda, yadda,yadda. Then the great Zadari will probably give a speech regarding this great democratic set up in Pakistan and defeating extremism in front of a portrait of “Great” Benazir and talk of the sacrifices of the PPP (in getting their loot out of Pakistan). There will not be any businees deals to sign. No showing off to be done because we only go backwards. Perhaps he’ll get a taste of our great mangoes. –> Dont want to be condescending but this is the truth: Pakistan is a middle-level power at best and cannot expected to be treated on par India or China. While India is a net contributor to the US and World Economy, Pakistan does the opposite. Get my point? Also lost in this discussion is the role of Richard Halbrooke, who had his share of admirers also honoring the exceptional achievements of Ambassador Richard Holbrooke and recognizing the monumental contributions he has made to United States and th world , humanitarian causes, and peaceful resolutions of international conflict. The Dayton Accords — the agreement Mr. Halbrooke negotiated which stopped the killings in Bosnia and paved a path to peace in the Balkans that endures today. He was central to our efforts to limit ethnic cleansing in Kosovo and pave the way for its independence, and he found a way to break the stalemate in talks in Cyprus. The ethnic cleansing of Muslims when the rest of the world in Asia and Europe specially the so-called Muslim world conveniently ignored. The critics of America and there are many in Pakistan forget this crass time in history while their Arab brothers were busy finding their fortunes in oil and building grand palaces. Known as a hard-working diplomat who wasn’t shy about being frank in his assessments and disappointment with Pakistan playing a double role on one hand taking tax-payer American money and also helping terrorist flourish, he is believed to have had more difficulties negotiating the more delicate atmosphere in working with weak-corrupt leaders like Afghan President Hamid Karzai. Ah You never miss a chance to glorify your country. Still you can’t help to comment on a country which is as insignificant as Bangladesh. Do you comment on Bangladesh newspapers as well? We know economy matters the most but right now we still are the front line state as much as we hate this fact so yeah we matter in a different way. However, we are grateful that Obama didn’t come. His visit will not bring anything to us. It’s only the media who is unhappy about this, not us. Cheers!